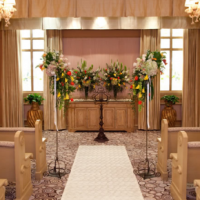 Both of the chapels in Bellagio feature neutral tones of champagne, taupe, cream and brown. 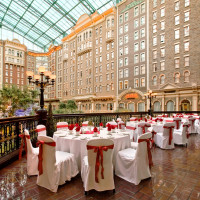 The details are quite pretty and intricate, including architectural sconces, hand-blown glass chandeliers crafted, lush drapes, and amethyst glass windows traced with gold leaf and Italian stained glass. There is traditional pew seating. 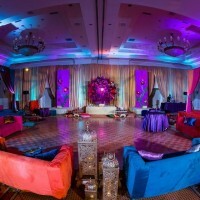 The south chapel holds 130 guests and the east just 30. No matter which chapel you choose, they only host one wedding at a time and they do not allow visitors during ceremonies. 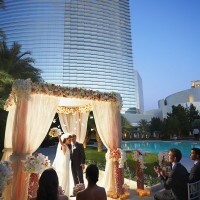 See real weddings at Bellagio featured on Little Vegas Wedding.